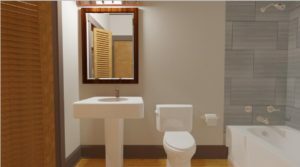 Architecture House Design|House Design | Handyman Augusta Ga.
Cad (computer-aided-design) design has been out for over 20 years. There are some good programs and there are some that aren't so good. The programs are no better than the user input. With that being said I have over 37 years in the construction industry building room additions, garages, storage buildings, and remodel jobs. Everyone of these jobs have been created by a cad program. I have been working with cad for the last 20 years and it has improved at an incredible pace. 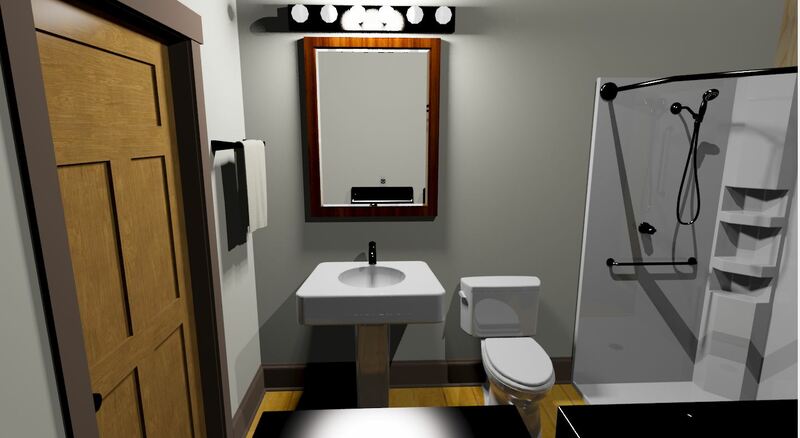 Using cad lets the customer see their designs before there built. Yes, it has blue prints just like architects produce. Cad offers so much more in terms of visual images. Our program produces 2D and 3D drawings. We can also produce video walk through of the project so you can get an actual feel of your new design. Architects that use cad programs charge $2000 and more for there designs. Most charge that much without cad programs. From simple design to the more intricate and elaborate visions, we can handle the design. Any design starts at the beginning. The most important tool in the whole process must be handled first. Yes, this very important tool is a tape measure. Did you think I was going to show you some high tech gadget? Every design starts with the proper measurements. Now if we're designing from scratch, measuring is not needed in the beginning. One of the kool things about cad design is that you can make changes to your design and see different styles of an object in a matter of minutes. Below we will show you how a simple design turns into a vision of beauty. First lets start off with the floor plans and move forward. These photos are for illustration purposes. As you can see this simple design is not quite finished. No toilet or urinal of any kind. Also no walls or rooms have been provided for these features at this time. 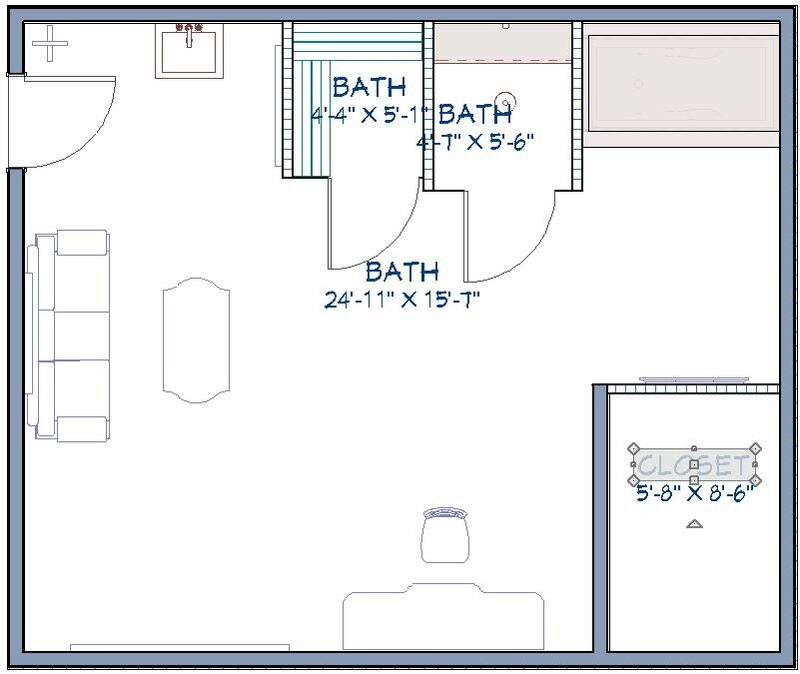 Photo above is a basic floor plan. 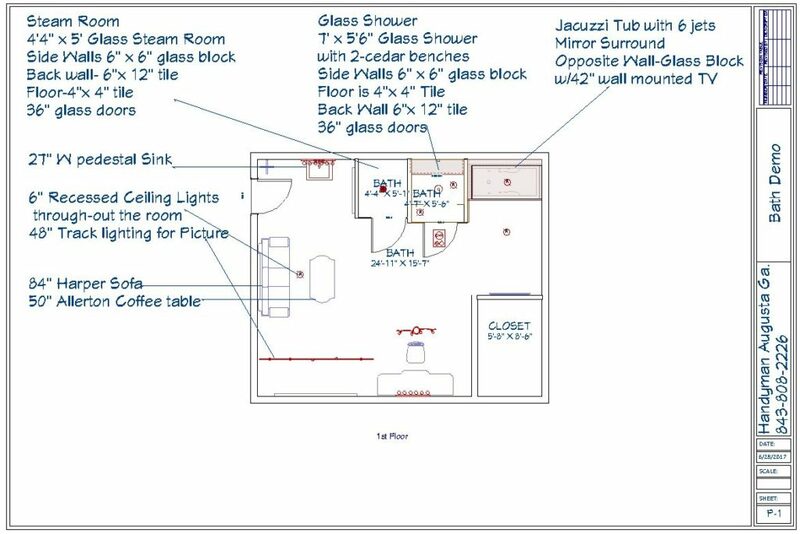 Photo below has details of items in floor plan. At this stage of the plans it doesn't look like much at all. For most individuals it would be pretty difficult to imagine what it will look like when finished. Some individuals probably wouldn't have any issues at all with this floor plan. But would you want to pay out around $12,000.00 for this drawing? This has been the norm for many years and is still being practiced, especially in the commercial market. I'm sure most of you have heard and are fairly familiar with the term. Cad has come a long ways since the early 90's. So let's look at more illustrations of what this simple plan can look like at it's best. Now that looks pretty good. You can see the items listed in the detail layout very well. This is a much better view than looking at a lot of lines with numbers. Let's push this design a little farther and see what happens. First lets look at another camera angle. 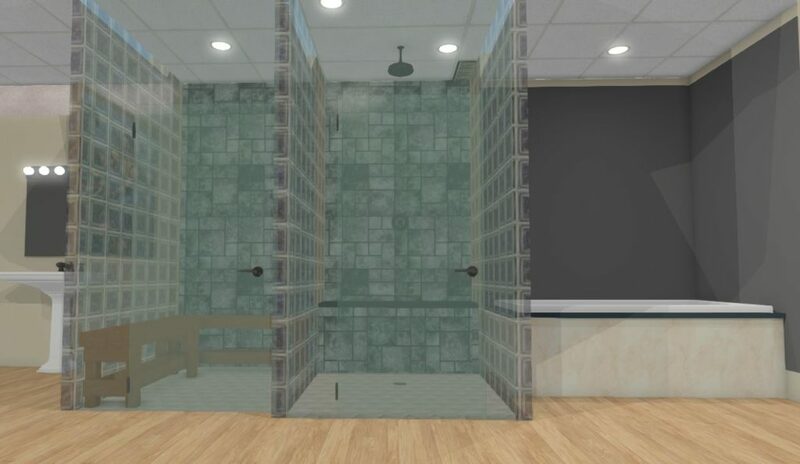 This view shows you the steam room, shower and tub area. You can clearly make out the objects in the room and understand where the $12,000 price originated. Let's push this photo one step farther. 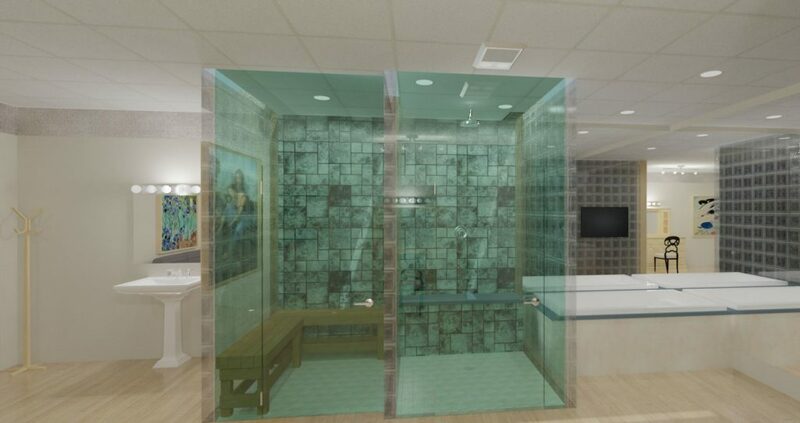 The photo below shows reflections in the mirror and on the glass walls of the 2 rooms. The detail on the tile and benches are just like the real product. This photo looks almost like a photo has been taken of this room. I can guarantee you this room has not been built. This reflects how far cad programs have come in the last 20 years. Please look at the tub on the right in the photo above and then look at it again in the photo below. Quite a difference, wouldn't you agree? Lets look at the rest of the room. The process used here has a blur effect that makes objects far away look more realistic. I hope this illustration of cad performance and designs has given you a new outlook on what can be achieved in today's computer era. 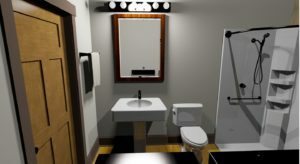 Cad designs are very inexpensive and you get 10 times more product than from architects at $200.00 per hr. Also, while the design is being built we give you alternative options to choose from. For example, different floors, wall colors, lighting, moldings, etc. With no extra charge. When there is a charge it's very nominal hourly fee. Check back regularly for more design ideas.